TSG CEO and co-founder, Noah Rafalko’s Q&A with SOMOS (formerly SMS/800) about the future role that texting will play as business adoption grows. TSG Talks Texting is part of an outreach program designed to educated and spread awareness about the technologies shaping the communications sector. As the operator in charge of the Toll Free Registry, this organization has been an invaluable partner in the toll free delivery services that TSG provides. 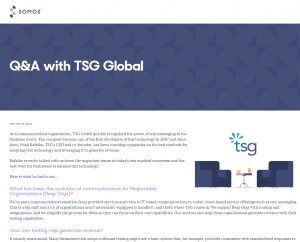 Through our relationship with SOMOS, TSG is helping to build a better telecom industry with proven use cases and assuming advisory roles in multiple regulatory working groups. SMS Texting is a natural evolution in communications. TSG’s mission of supporting enterprises, carriers and large vendors has allowed the creation of a network that not only delivers flawless communications, but allows users to build more revenue into their products. Unfettered access to the technologies used to build products that innovate and out-create is how TSG nurtures the growth of the Modern Enterprise. Gone are the days of the captive customer and TSG is leading the charge by putting you in control of a vast ecosystem of partners. The Q&A piece can be found on the SOMOS website. Click to view the original article on the SOMOS website.